This is number 10 in my series in my effort to tame my upcycled blues - of which I had about 6 plastic tubs of unorganized pieces - but have subsequently found another big bag full. Since the boxes weren't organized nicely, I had thought I'd get between 7-9 tops out of them in order to get the amount to fit into two plastic boxes. I considered 2 tubs a reasonable amount to have, but 6 - too many! While I was almost to my goal of getting down to 2 large plastic tubs/boxes, I began to clean up my daughter's room in order to make the bed so she could have some place to sleep when she came back for Christmas. Yep. More blues. Quite a few more in fact. I think that people must wear a whole lot of blue! Once again, for some variety, I threw in some greens. I also did that because some of "blues" are pretty "blue green-ish" and I thought it would be fine to add the greens in there. In the end, I'm glad I did. 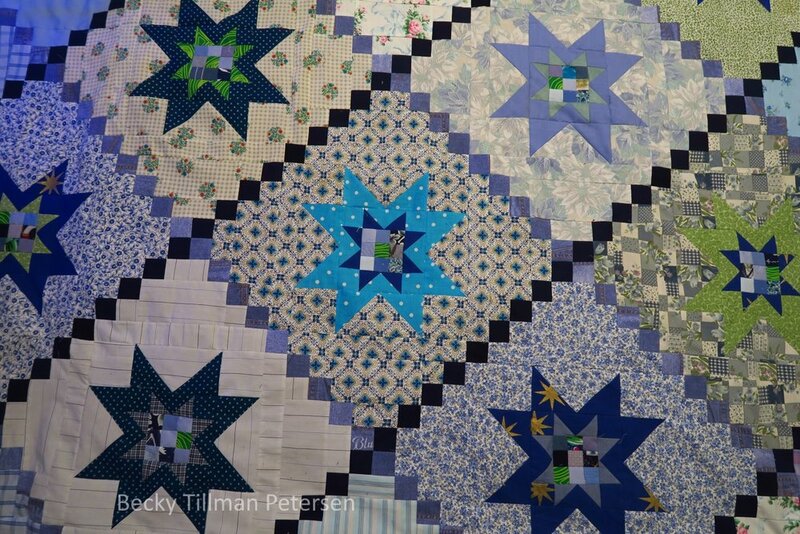 So, rather than despair, I went back to the drawing board and designed a few more quilts. This is the first of those extra ones I hadn't planned on making. I knew I wanted another chain. I made a chain quilt with Triple Irish Delight - but I'm kind of fascinated by the look of a quilt with a chain block. I'm not done either...I have another one planned (hint, hint). The thing that made this one a bit more complicated to make is that I wanted each background of each section to be different. I had hoped that a shirt or blouse or part of one would work. And it did. 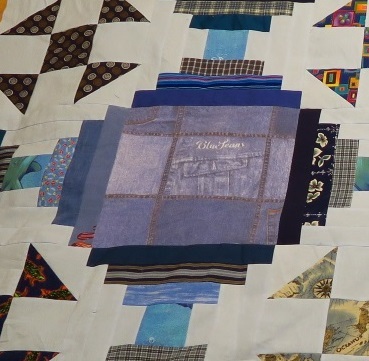 Cutting out this quilt took almost as much time as sewing it together. Seriously. I've been dreading writing the pattern for this one. It's a bear! As to the making of this top - I actually totally enjoyed making this one. It was as if it "came alive" as I worked on it. The stars were fun - and I liked the challenge of finding contrasting - at least enough to see - fabrics so that you can see the star in a star. The chains going off to the right - the navy ones are several different navy shirts/blouses I used parts of. The other, lighter chain is also a duvet cover - that was a bit variegated in the design. It is the same fabric I used as one of the pieces in the periscope pattern - You can see that the fabric has a variety of shades in it though it is mostly pretty close to the same. 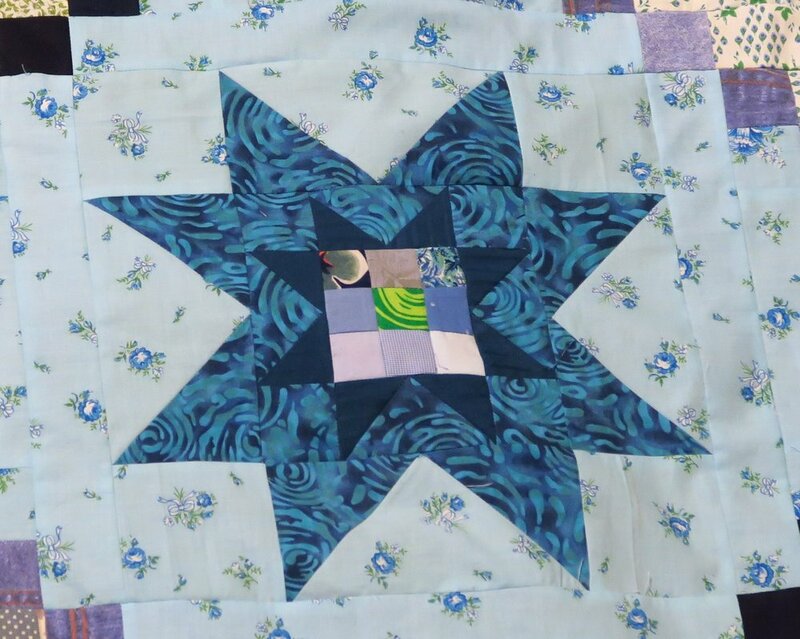 This blue fabric square is the same fabric that I used for the lighter chain in this quilt. It was a duvet cover so I had quite a bit of fabric in it. So once again...just in review - here are the tops in this series so far. I'm having fun taking these pictures as I get more and more of them! Don't forget to the check the goodies my sis has for you over in the store!